In this area of the GameZone selected universities are presenting their student’s newly developed games. Everyday life consists of Science – the air that we breathe, the sun shining on our skin, the taste of popcorn and the distinctive smell of a cinema. At the same time, Science is complicated and often hard to understand. Here, the wonderful symbiosis between “Science and Animation” begins. The heartbeat of the visualisation of physiological processes started 1861 already; the “All Seeing Eye” has a candid view of corpuses, corals and cinematography. The unseen, which is held together by “Invisible Forces”, claims its space and the “ABC of Science” offers points of view from amused to zany. The “Imaginative Apparatus” is racing high, releasing enormous power. This power fuels “Cells, Cells, Cells”; their complex interactions finally create the “Blumenwunder” (wonder of flowers). The Game Jam on the subject of “Kammermusik” (“Chamber Music”) is the result of a new cooperation with the Stuttgart Kammerorchester (SKO). This competition has classical music at the centre of its playing idea. Five teams of four people maximum were chosen among the candidates, who – over the course of 34 hours – develop interactive experiences to accompany, highlight and add to the live performance of a chamber orchestra. Musicians of the SKO are on site to help with suggestions and questions relating to the musical parts. The developed gameideas are presented on Sunday, 05 May at 18:15 on the big LED screen at the Schlossplatz. The Music Game Jam starts on Friday, 03 May at 11 am and finishes on Saturday, 04 May at 8 pm. Diversity, democracy and freedom are at the core of “Hack for Future”. Creative programmers, game designers, graphic designers, students and people interested in Europe are developing playing ideas and first prototypes on the subject of Europe as part of this two-day Game Jam. At the same time, the “Hack for Europe” provides a forum for exchange of creative people in the animation and games sector. 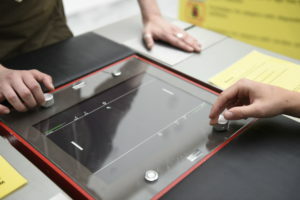 The developed game prototypes are presented and played on Sunday, 05 May at 17:30 on the big LED screen at the Schlossplatz. The “Hack for Europe” starts on Friday, 03 May at 11 am and finishes on Saturday, 04 May at 8 pm. “Prologue: The Fate of Assassins” by Tsui Ka Hei, Haze is based on Dragon’s Delusion, a comic by KongKee (Kong Khong-Chang). The comic is a sci-fi revisionist take on a piece of classical Chinese literature, “Encountering Sorrow”. The Poem expresses the sorrow and helplessness of Qu Yuan the poet parting with a dying kingdom. Joe embarks on a journey to search for his true self. And he didn’t know he was pulled into a secret mission of assassinate Emperor Qin. “Prologue: The Fate of Assassins” is a side story about the assassination attempt. With the plan of pretending a performer in front of Emperor Qin. One step closer, one step towards the accomplishment. When an animator meets a choreographer, the former seek to expand the realm of storytelling by bringing in the latest technology, virtual reality, into a performance. It raised the tough question of liveness of the performance when the dance is actually appearing in a virtual landscape. Also recalling the conflicts between Reality versus Delusion… With dancer Huen Tin Yeung (artist name: Cliff). Are you up for breaking through the door to virtual reality and compete as part of a team? Then Breuninger is the place to be: the multiplayer playground HOLOGATE lets you dive deep into the game world together with up to three friends, family members or spontaneous co-players! You are not controlling an Avatar, you are the Avatar – perceiving your surroundings from inside his body. Equipped with high-end VR headsets and controller, you delve into a virtual adventure for ten minutes. No need for any previous knowledge or preparation – you can start right away. As a team, you coordinate and plan your moves in the game. The system stores your high scores and the daily and weekly winners can look forward to great prizes. Whether it’s a snowball fight with penguins in ‘Cold Clash’ or hot dance moves in the virtual world of ‘Groove Guardians’. All that is needed is physical commitment and what better place to go for this than the Sports department on the 3rd floor at Breuninger?